Ancient people built their villages and towns near water sources. If there was not a spring at the base of the hill where they settled they would need to dig a well, a shaft, or a tunnel to reach the water source. 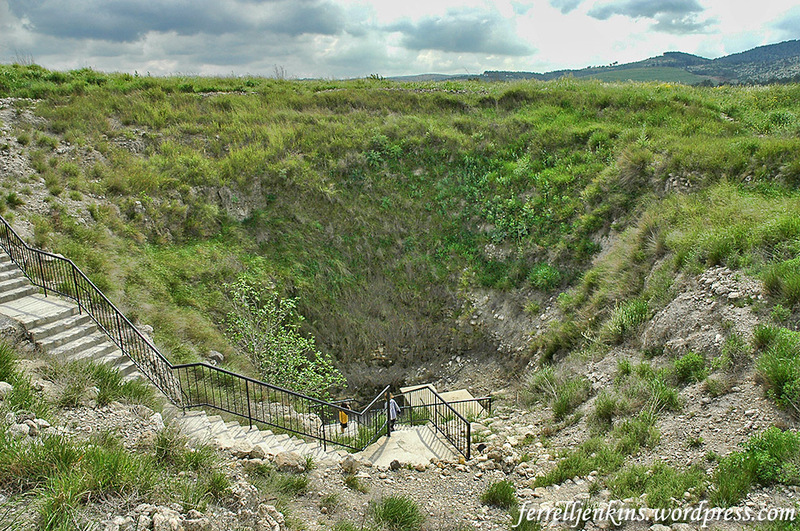 As mentioned before, there were two springs at Megiddo. The nearer one was located on the western side, at the bottom of the mound. There were two obvious difficulties in the use of the water by the inhabitants of the city. First, in order to obtain water for daily use, the inhabitants – and these were most probably the ladies – had to descend the steep slope down to the spring and then carry the water in jars back to their homes which were situated on the summit of the mound. Second, in time of siege, the spring remained outside the city-walls, and thus inhabitants could not reach it while the besieging army had easy access to the water. These difficulties were overcome by constructing a huge water system (Figs. 2.5; 2.22; 2.27). A vertical shaft was cut in the rock from the surface of the mound. Starting from the bottom of the shaft, a horizontal tunnel was cut in the rock till it reaches the spring. At the same time the approach to the spring from outside was blocked and hidden from view. The way to the spring now became easier and safer: one had to descend by rock-cut steps down the vertical shaft, and then walk through the horizontal tunnel to the spring. In a later stage, the bottom of the horizontal tunnel was lowered, so that the water flowed by gravitation from the spring to the bottom of the vertical shaft. From here, the water could be raised with the aid of pulleys to the surface of the mound, saving a lot of work and energy. Naturally, as time passed and the settlement was abandoned, the water system was filled with debris. The Chicago expedition [1933-1939] made a huge effort excavating and cleaning up the water system, restoring the steps in the vertical shaft, and preparing the place for visitors. 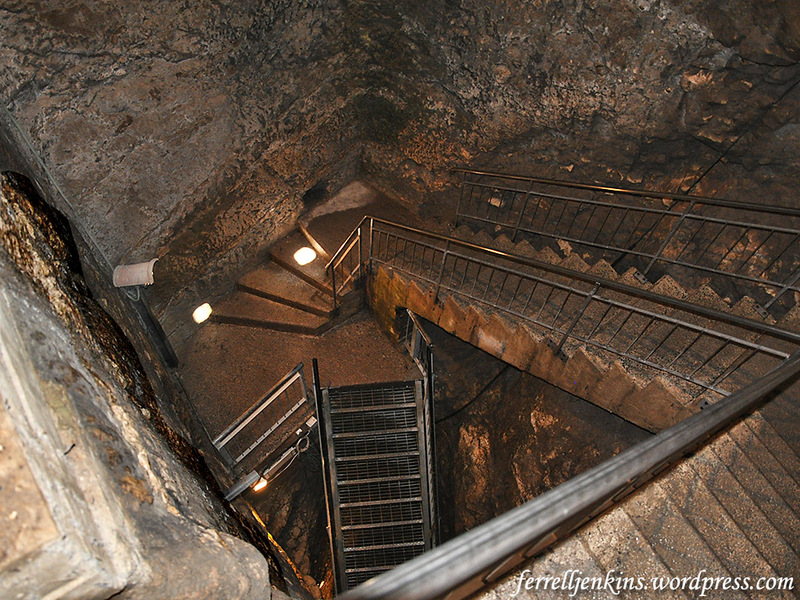 The water system is now one of the major attractions for visitors to Megiddo. Source: Ussishkin, David. On Biblical Jerusalem, Megiddo, Jezreel and Lachish. Hong Kong: Divinity School of Chung Chi College, Chinese University of Hong Kong. 2011: 66-67. The sign at the entrance to the water system was in poor condition when I made my photo. I have made a drawing based on that sign showing the various elements of the system. 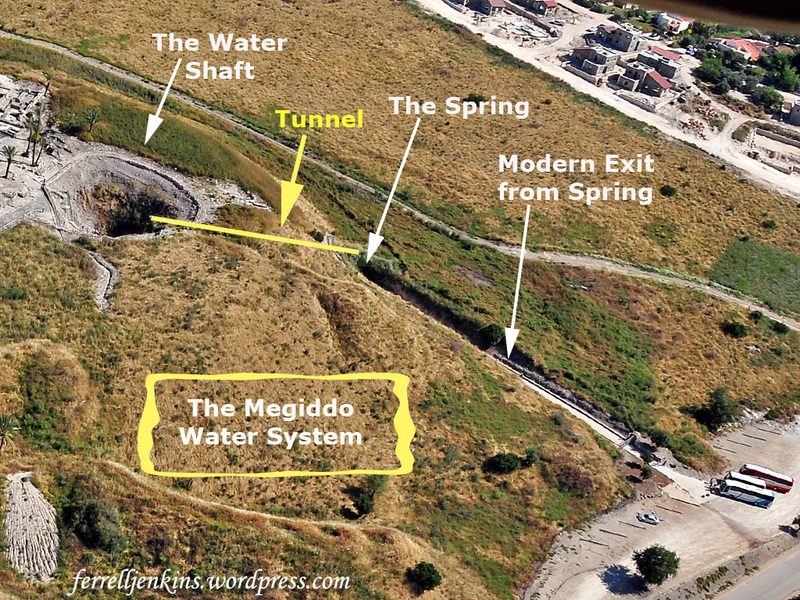 The Megiddo water system. Based on the sign at the site. Our photos will take you through the water system step by step. The first photo shows a view of the entrance to the system from the top of the tel. The shaft of the Megiddo water system from the top of the tel. Photo by Ferrell Jenkins. I see a variety of figures regarding the depth of the shaft and the length of the tunnel. 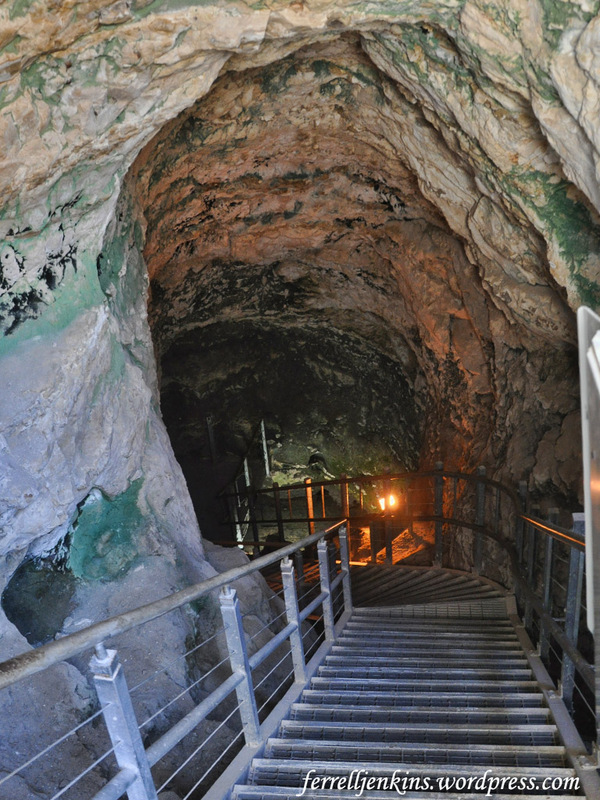 The brochure distributed by the Israel Nature and Parks Authority says the shaft is 36-meters-deep [119 feet]. (Download the brochure here.) There are more than 180 steps down to the tunnel. The tunnel was cut on an incline so the water would flow to the bottom of the shaft and the inhabitants could draw water while standing at the top. The outer entrance to the spring was sealed with a massive stone wall, concealed with earth so that an enemy besieging the city would not discover its location. Steps going down to the level of the tunnel. Photo by Ferrell Jenkins. 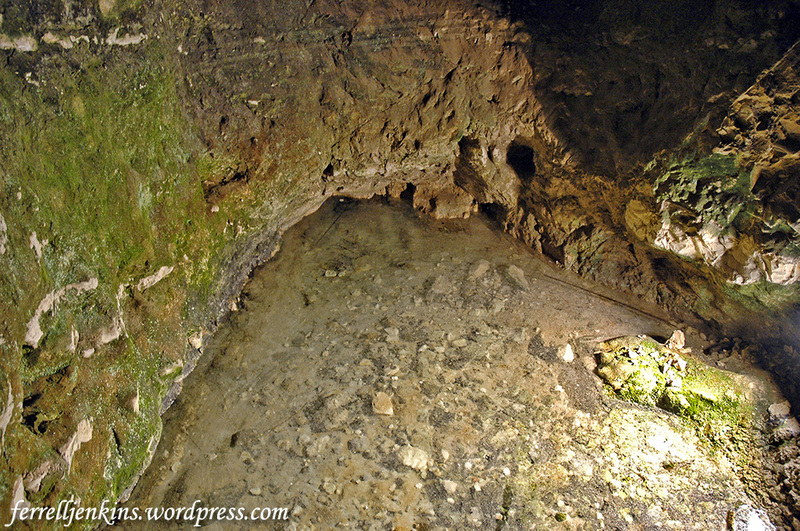 The water flowed from the spring on the western side of the tel through a 70-meter-long [230 feet] tunnel. I have never seen the water in the tunnel, but I recall a few times when tours were not allowed to go through the tunnel due to high water. 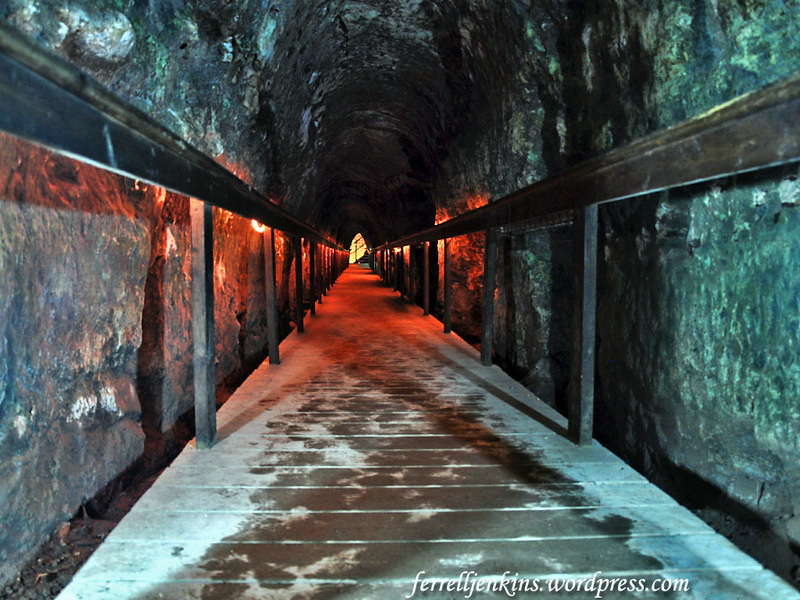 The tunnel at Megiddo with a modern walk for ease of traversing the length. Photo by Ferrell Jenkins. Only a small amount of water was seen at the spring in this 2006 photo. The spring at it was on April 02, 2006. Photo by Ferrell Jenkins. The aerial photo below shows the portion of the tel where the water system is located. You can see the opening of the shaft, and you can see there the tour buses are parked awaiting the tourists who have visited the tel and walked through the tunnel. A modern cut has been made to the modern steps leading to the spring. 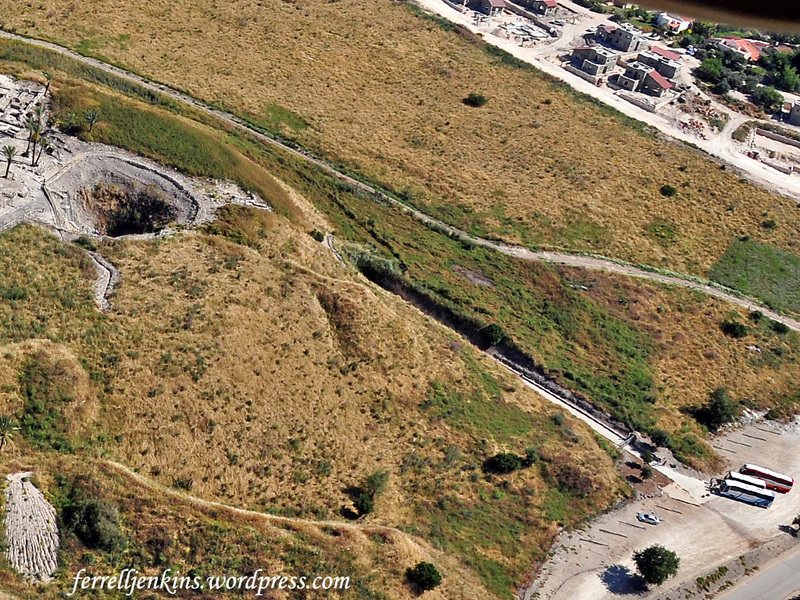 Aerial view of the Megiddo water system. Photo by Ferrell Jenkins. Our next image is the same photo annotated to show the various parts of the system. Compare this with the drawing above. Annotated aerial photo showing elements of the water system. Photo by Ferrell Jenkins. The next photo was made near the top of the steps that lead from the spring to the exit. After exiting the tunnel, this is the view down the steps to the spring. Photo by Ferrell Jenkins. A water system and tunnel which brought water from a spring outside the city is now thought to belong to the time of Ahab. Chris McKinny gives the dates of Ahab’s reign as 874-863 B.C. in The Regnal Chronology of the Kings of Judah and Israel. Not all of the smart people live in the 21st century A.D. This entry was posted in Archaeology, Bible Places, Bible Study, Israel, Old Testament, Travel. Bookmark the permalink.